Please Note: This article does not apply if we currently remotely host your MIDAS system in the "cloud"
If you're moving servers, or have inadvertently locked yourself out of MIDAS, we've now produced a helpful online self service tool to help get you quickly back up and running! If any of the above apply to you, our self service tool should have your MIDAS system back up and running in no time! You can then load this copy of your midasglobal.dat file into our self service tool, change your settings, and a replacement midasglobal.dat file will be automatically generated for you, which you can then upload back to your server to apply the changes. Selecting this option will list all of the databases currently associated with your MIDAS system, along with each database's current MySQL settings (expect for the MySQL password, which is not displayed for security reasons). From here you can then update the MySQL server (Host), MySQL database name, MySQL username, and MySQL password for each of your MIDAS databases (leaving the MySQL password field entry will retain your current MySQL password). NOTE: If moving to a different MySQL server, you will first need to export your existing MIDAS MySQL database(s) from your current server, and then import them into your new MySQL server before using this tool. If you need to relocate your installation of MIDAS to a different server, you will need firstly copy your entire MIDAS installation across to the new server (as well as your MIDAS MySQL databases - if applicable). Please ensure that when copying files between servers that existing file permissions are also copied across. Your New Support Files URL - In most cases this option won't be shown. However, if you originally installed the "Support Files" for MIDAS (images, etc) to a different location to the main program files, you will be able to specify the URL to the location of these files on your new server here. If you've forced your MIDAS system to use SSL (https), and there's a problem with your server's SSL certificate, you may be unable to access your MIDAS. This option restores access to your MIDAS system over a normal http connection. If you've restricted the IP address/range that is allowed to access your MIDAS system, and your device's IP falls outside of that address/range, you will be unable to access MIDAS. 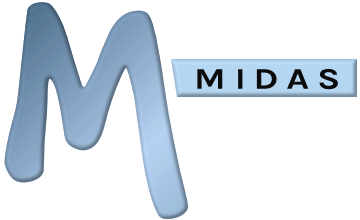 This option removes all IP restrictions allowing you to access your MIDAS system again. If you've enabled Two-Factor Authentication (MIDAS v4.10 or later) yet have not correctly configured the software to be able to send emails, then no-one will be able to login to your system until Two-Factor Authentication is disabled and/or you've corrected the software's email settings. If you're unable to login due to this, this option disables two-factor authentication allowing you to regain access your MIDAS system again. WARNING: Incorrect settings when using our self service tool may prevent your MIDAS from running. Always backup your current midasglobal.dat file before proceeding.